Mary Elizabeth Jane Colter (1869–1958) was an American architect and designer employed by the Fred Harvey Company for 30 years. She created a series of landmark hotels and commercial lodges through the southwest. 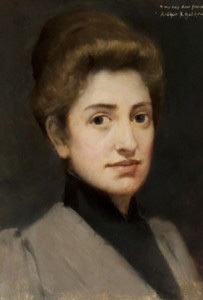 She designed the “Painted Desert” exhibit, which was built by the Santa Fe Railway, for the Panama-California Exposition, with the help of Herman Schweitzer, superintendent of the curio and promotional service for the railway.